It is summer summer summer-TI-IME, and that means it is tomato season. Yay! There’s nothing quite like the beautiful seasonal tomato, especially since tomatoes out of season can be bland and mealy, the embodiment of edible pointlessness. But not the summer tomato, which does not get all Sartre on us in its sweet and meatishly present deliciousness that smells like sunny days and cool evenings. Suffice to say, this is one of my favorite times of the year. Since I love to cook during tomato season, and have been having so much fun with it, I’m happy to present not one, but TWO simple recipes that make the most of what seasonal tomatoes have to offer. 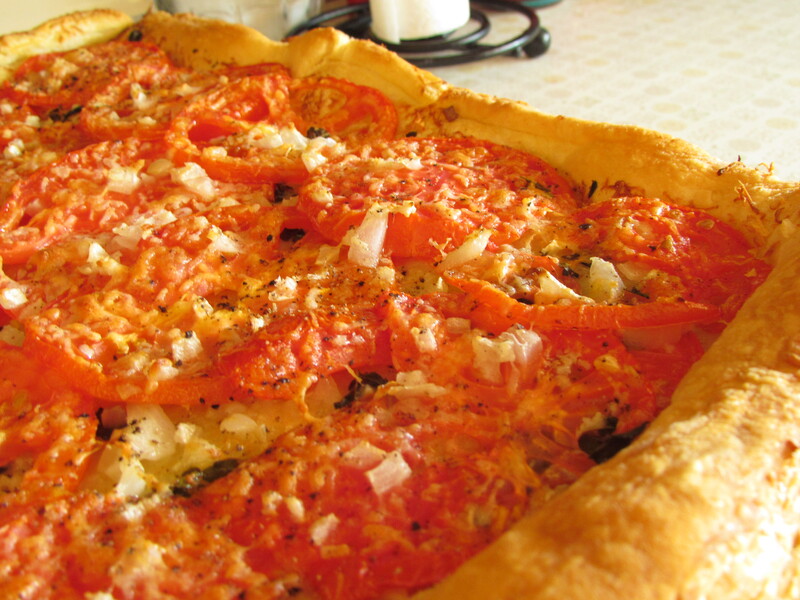 First up: Tomato Tart. 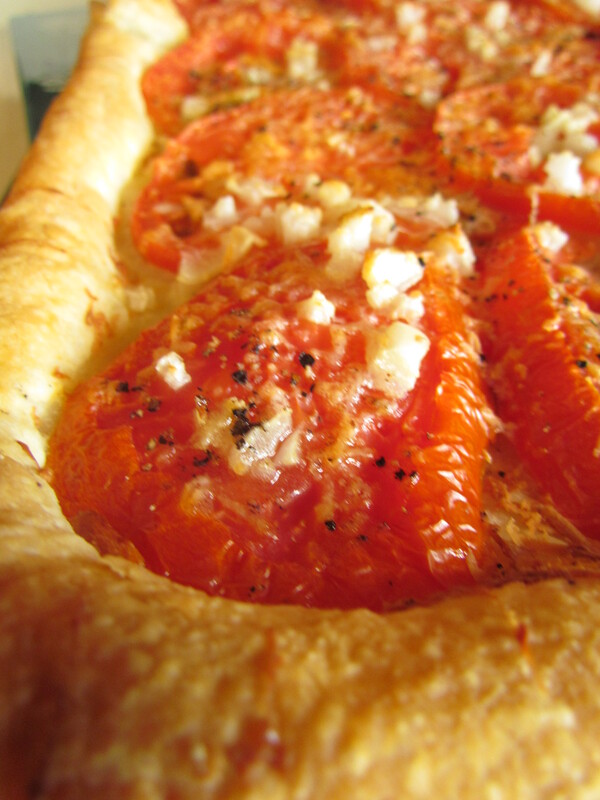 Tomato tarts are eeeeeeeeeeeeeasy. And flexible. They are receptive to whatever you’d like to accent them with, so long as they A) remain relatively simple and B) don’t ever forget that tomatoes are the stars of this show. So I used puff pastry (but you could use a pie dough, and if you’re wondering what’s “better” for you, then you need to consider things that do not make use of crusts, as they are generally all fat and refined flour) because that’s what I wanted to use. If you need to thaw your dough, set it out now to get it ready, but dough doesn’t take that long to thaw, so in the time it takes you to prep your veggies the dough will become ready for use. Preheat your oven–how long should your tart bake for? What’s the package say? How long does your grandmother say her secret dough recipe should bake for, and at what temp? Do that. 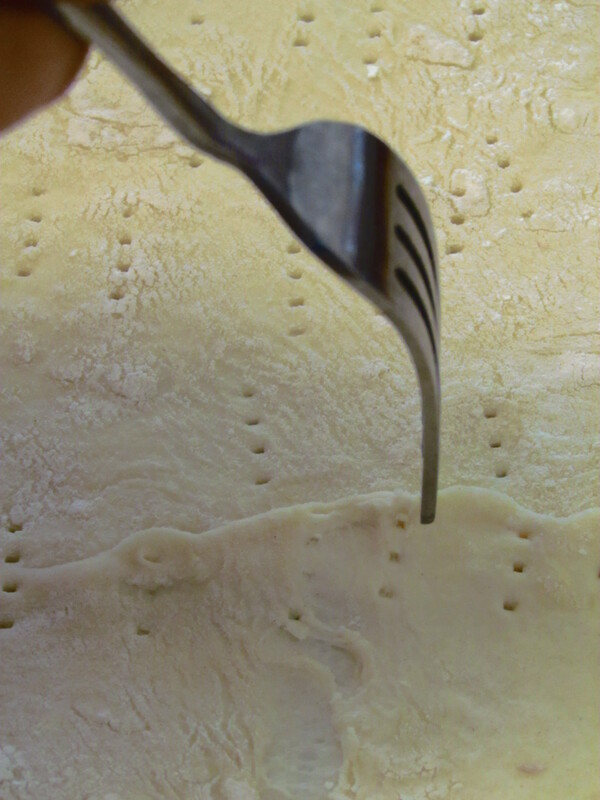 Spray your baking pan with a non-stick cooking spray, stretch the dough to fit, and if (like me) you chose to use prepackaged puff pastry, dock the dough. Wha-wha the dough? Poke it repeatedly with a fork. That’s docking, and what it does is creates vents for steam to escape, so it won’t make the pastry puff, it’ll just bake to a golden deliciousness. Action photo! Feeling stabby? 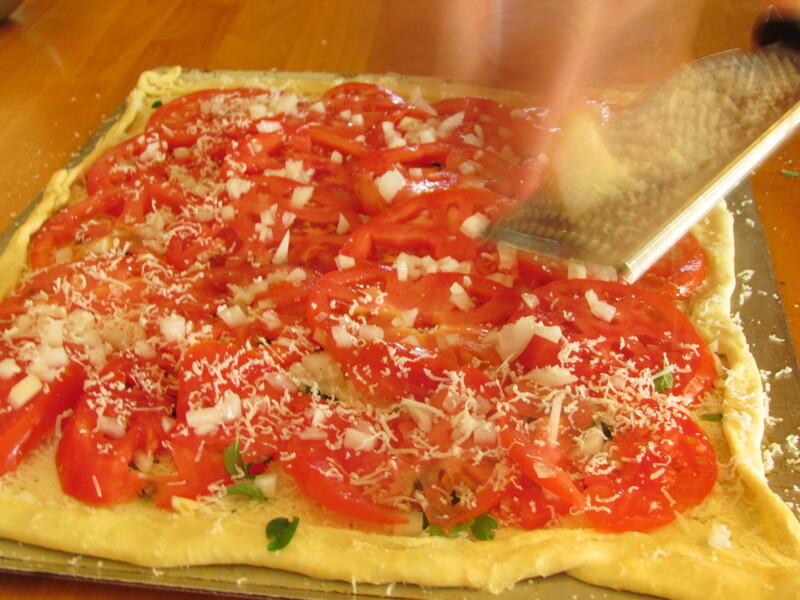 Make a tomato tart. 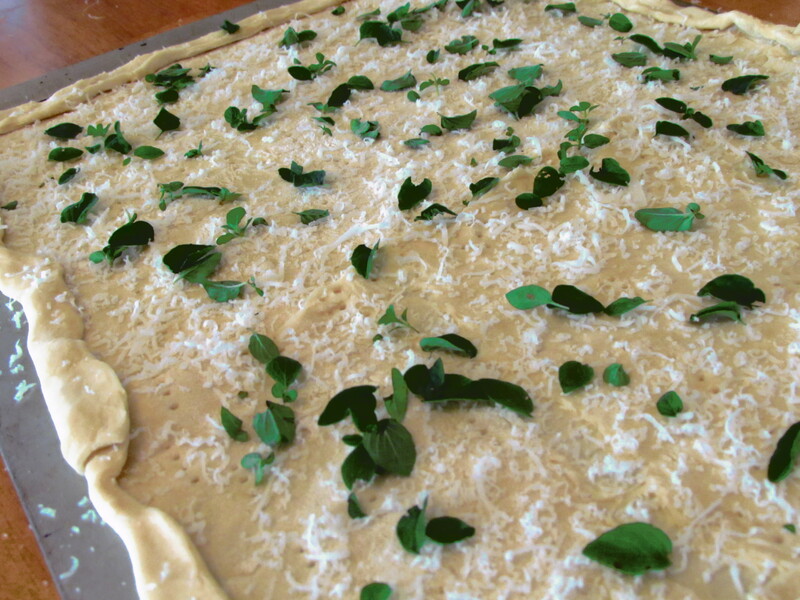 Don’t dock the edges of the tart; it will make for a puffy crust, which is visually interesting and sort of fun. I have a ton of oregano growing in the back yard, so I cut a bunch and cleaned it, and put that on, as well as the shreddable cheese I had in the fridge. I had a hard goat cheese (it was called “naked goat cheese”, how minxy!) but use what you have. Parmigiano-Reggiano never fails to deliver. Asiago. Provolone. I’ve also seen recipes where you dot it with ricotta. The possibilities are that wide open. This is off to an excellent start. Simple so far, yes? So. Slice your beautiful tomatoes; this took two good size, large, fat, delicious, beautiful, ripe tomatoes. And, a word about buying tomatoes, if you don’t have the luxury of a garden…in order to tell if they’re ripe, smell them. If they don’t smell like they’ve recently come off of a vine, they probably haven’t. Sniff + meh means they were picked early and forced to redden through the clever use of gases. 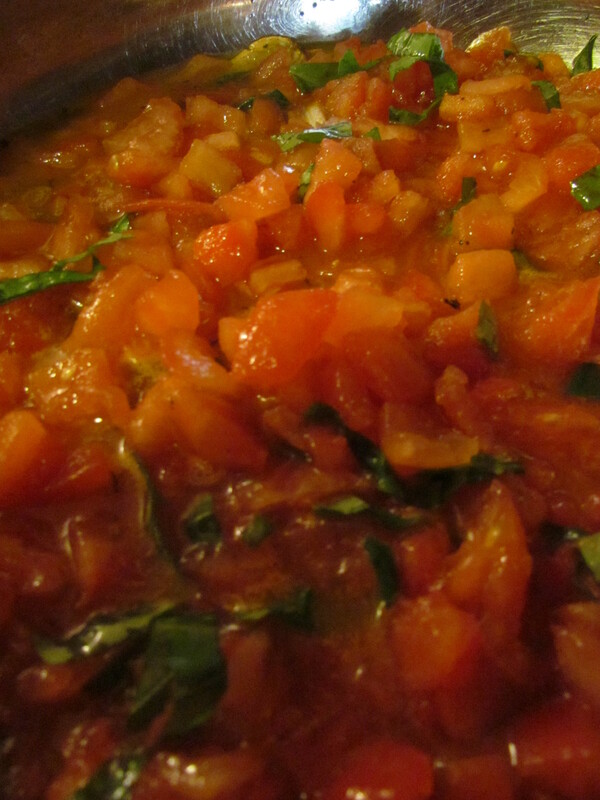 Sniff + drool because it smells so good means that’s a tomato that is ready to be celebrated, so dig in. And I have digressed, so back to the prep work. I had a half an onion I’d already cut into for something else, so I diced the rest of that up and (as always) chopped a few cloves of garlic. If you didn’t want to do either of that, that’s fine. Really! The most basic (and perfectly tart-like) tarts are SIMPLY tomatoes in a dough with some cheese and herbs. Prep, arrange, and top with cheese. Just remember, this isn’t a pizza, so you don’t need to get crazy with the cheese. Just a little will do. You can put on some salt, but depending on your cheese that may be kind of salty, so bear that in mind. Grind some pepper, give it a drizzle of olive oil and put it in the oven for however long the directions say the dough should bake. Puffy in all the right places. 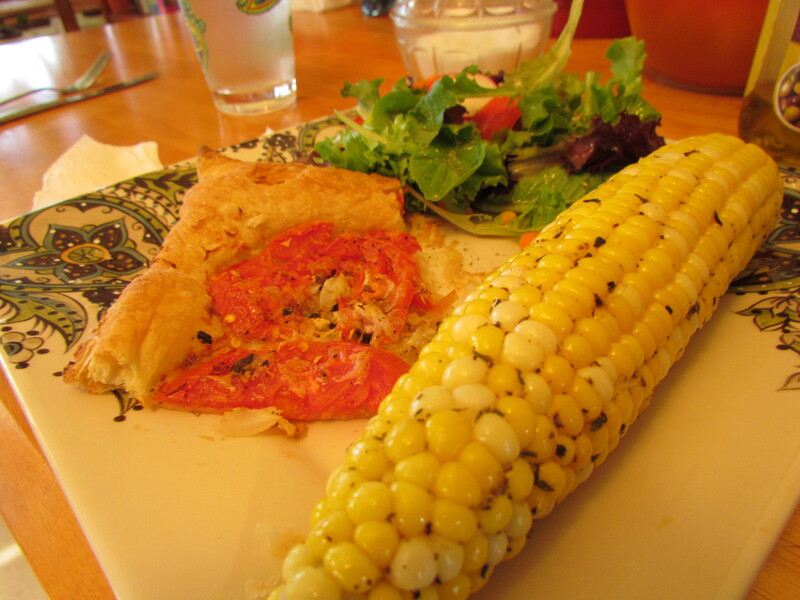 That is one happy, summery plate. The next recipe is for pasta in a super-fresh sauce–it is very lightly sauteed, but primarily relies on the impact of the fresh ingredients to make its foodie statement. 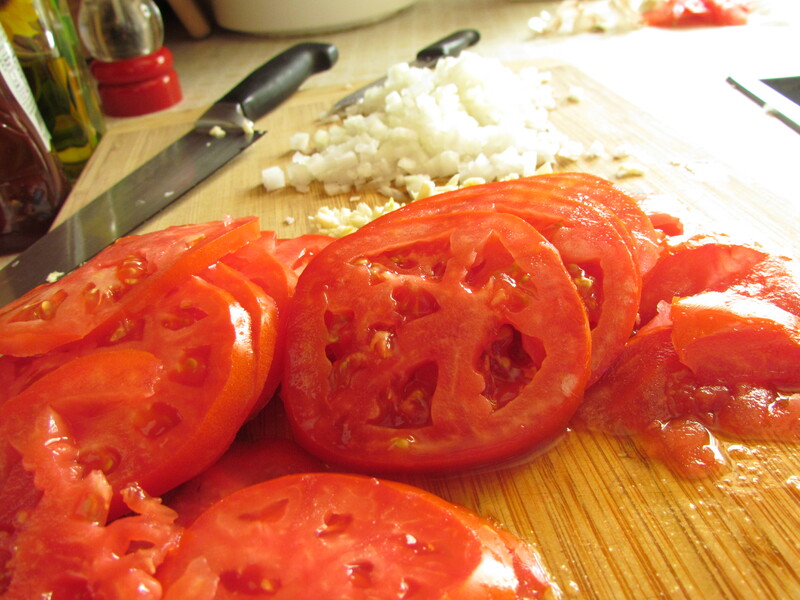 First, get three pounds of tomatoes (sniff-test standards always apply) and peel, seed, and chop them. Peeling a tomato is super-easy, though I’m afraid there’s no getting around the mess when you’ve got three pounds of them to manhandle. 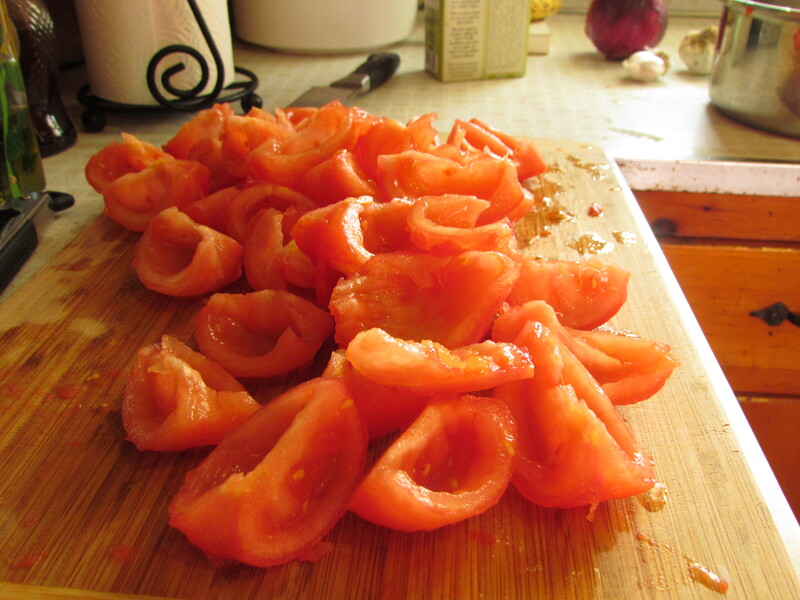 First, cut X’s in the bottoms of all the tomatoes. Blanch them for thirty seconds in boiling water–your objective isn’t to cook them but to loosen their skins, so don’t leave them in the boiling water for too long. In various stages of preparedness. Notice how the skin has loosened along the X's on the tomatoes on the plate. Once they’ve cooled, finish pulling the skins away, then seed. 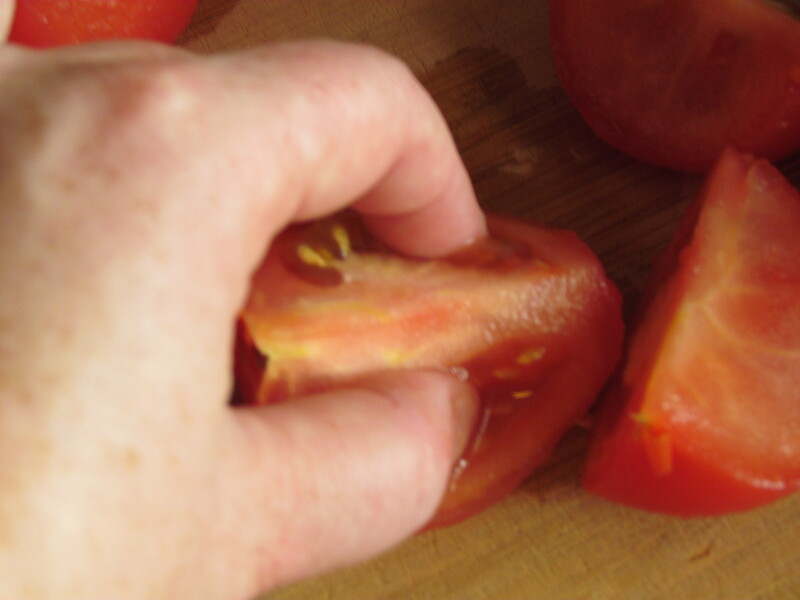 There is only one way to get seeds out of the tomato; just stick your fingers in and pull. Sometimes, the hands are the only appropriate tools for the job. This isn’t a seed-removing contest, so don’t knock yourself out getting every piece of seed out of there, but get the vast majority of them and all the gooey stuff. Ready to get diced into quarter-inch pieces. 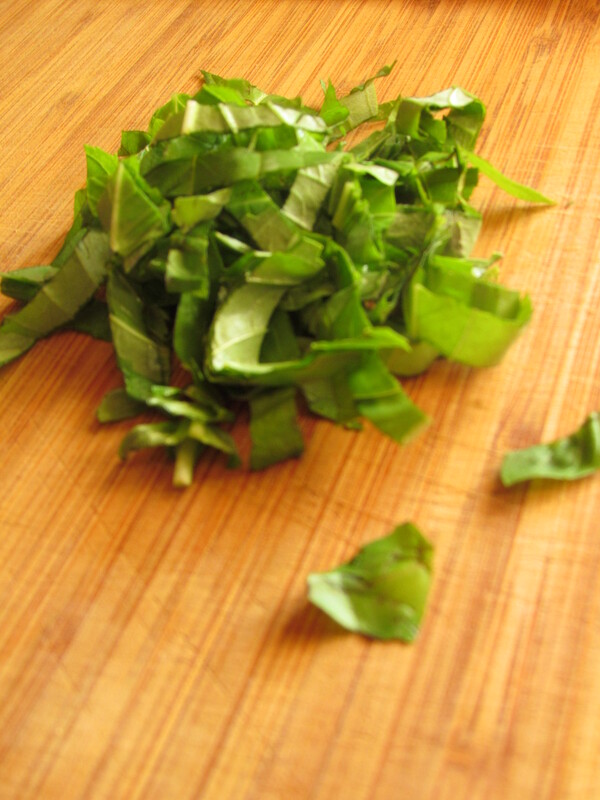 Once they are chopped, throw them into a bowl to sit for a half-hour at room temperature with some torn or chopped basil and olive oil. You want to use good, extra-virgin olive oil because the flavor is integral to the dish. This is all going to hang out together and trade each other's deliciousnesses. Once that half-hour has passed (and you have the pasta water boiling and ready for pasta, as you’re going to start that with this portion of the dish, so dump that in your water, and use something long like linguine), put more olive oil in a large pan–a little more oil than you normally would, as its flavor is integral to the final outcome of the dish, though the original recipe I saw called for seven tablespoons at this point, and I just think that’s way out of hand–and get it heated. 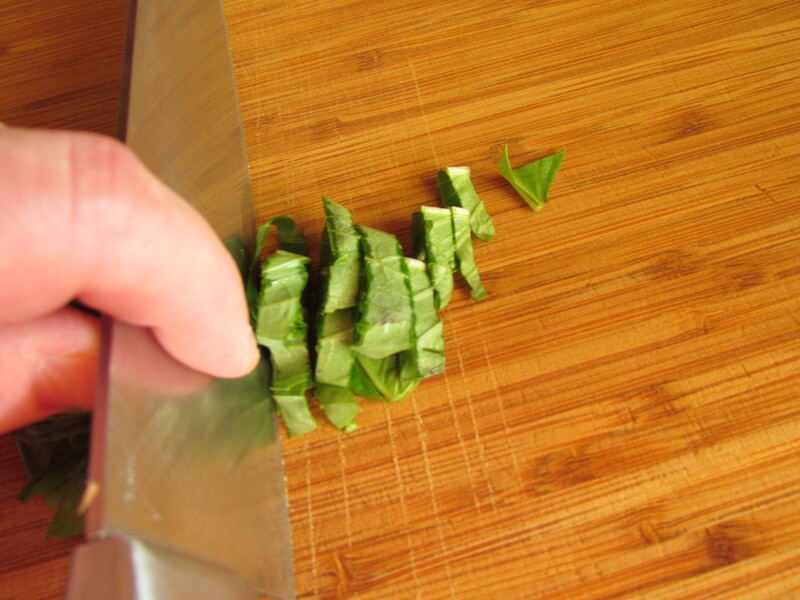 Put in some finely chopped thyme and garlic that’s been lightly cracked, but not necessarily chopped. 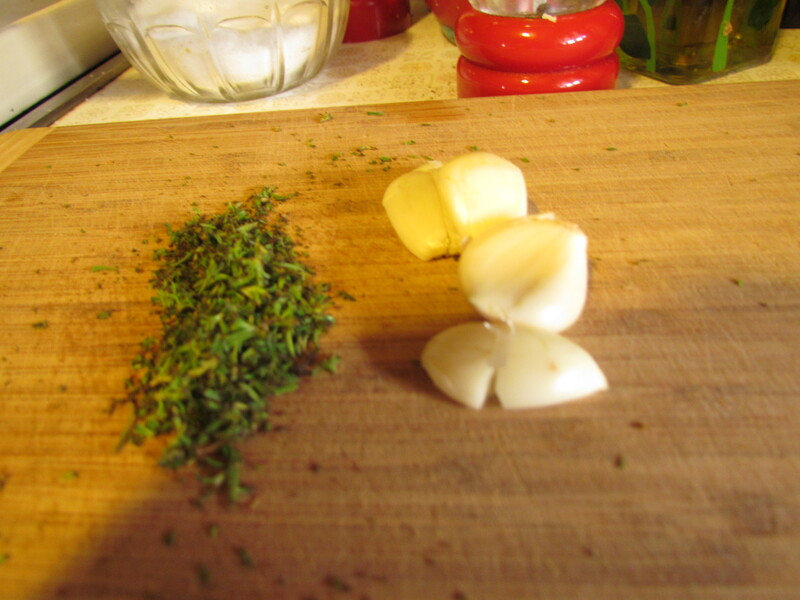 Let that cook for a very short period of time–the garlic will probably start to brown in about thirty seconds and the thyme is a little less susceptible to immediate and tragic overdoneness but can burn if left unattended. 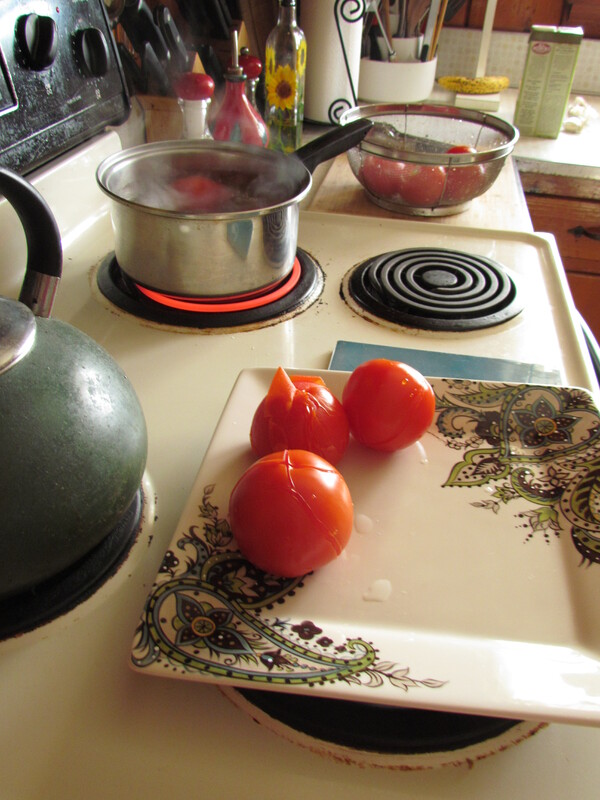 Once the garlic turns toasted-brown you can pull it out and hold it on the side until the rest of the meal finishes cooking, or you can fish it out later, but either way this is when the tomatoes get poured in. Get everything cooking at a nice, reasonable simmer (you’ll start to see bubbles) and keep it going at this pace for about five minutes. 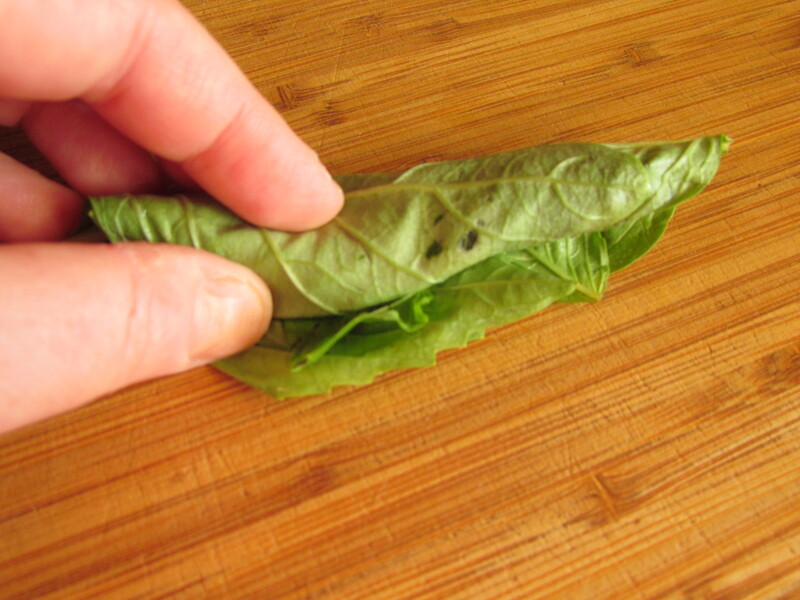 Stack your basil, and roll it. Slice the stack (don't hold your knife like this, kids, I should have just put it down). 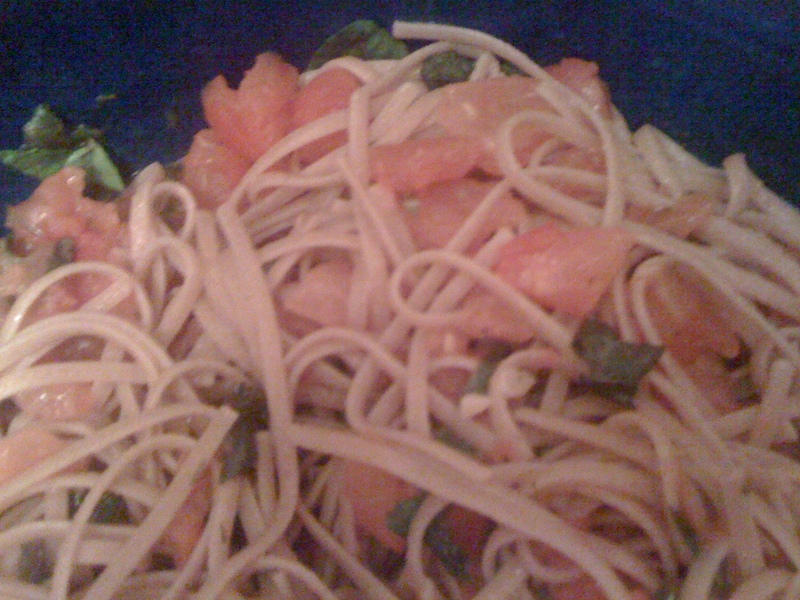 OK, so here’s my confession: my good camera’s charge died literally just as I was going to take a final picture, so the image of the pasta and tomatoes together comes from the iPhone, which is a good camera, but still. It was delicious. Serve this with some grilled veggies and crusty bread, to help soak up all the tomatoey-basilly olive oil, and you won’t regret a single moment. Tomato season. One of the most wonderful times of the year. 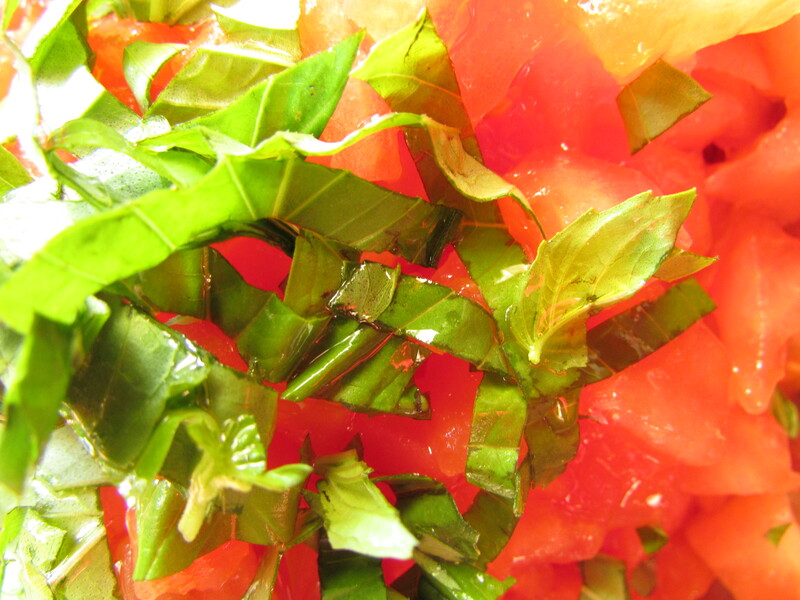 9 responses to Nosh: Tomatoes! 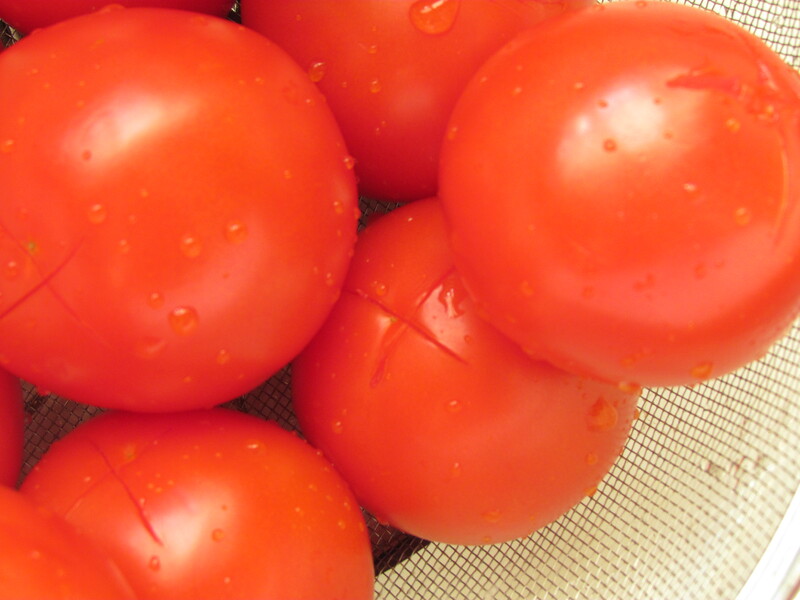 I think I will give your recipe a try: I love both tomatoes and puff pastry! I’m delighted to hear it! It was mighty tasty. 🙂 Enjoy! YUM!!! Thanks for the tomato ideas!!! Including over here…come on over and harvest some sweet cherry tomats, if you have use for them! Thanks! Very, very much appreciated, and I make no guarantees but I’ll try and keep up with the writing. As for the theme, it’s a design from WordPress, I would have no idea how to go about doing this myself.